Stations is my labor company in the office furniture business. 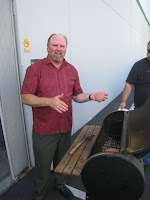 When their people go ninety days without an injury at work, they throw a BBQ. The theme of the most recent BBQ was a burger challenge. Andrew and Brian, the owners, decided to see who could cook the best burger and they asked me to be the judge. When I arrived at Stations, two grills were hot and smoking in the back. One grill, a smoker, puffed smoke out its back chimney. Andrew cooked up his burgers on this one. He decided to let me try two different burgers. Burger #1, sat on a beautiful sesame bun, that looked vaguely familiar. 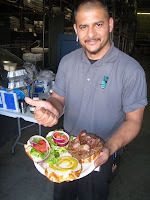 Andrew placed a large patty, estimated at about a half pound, on top of the toasted bun slathered with “secret sauce”. Grilled onion, tomato and crisp, honey-tasting bacon sat on top of a patty whose juices flowed despite the burger being cooked medium well. With no cheese on the burger, I noticed the unique taste of the patty resulted from bleu cheese in the burger. Burger #2, also Andrew’s, had the same bun, sauce, vegetables, but added jack cheese to an even juicier patty. The flavor of this burger was exquisite. I could taste a little garlic an Andrew confirmed he added garlic salt, pepper and a little Worcestershire sauce to the meat. He had cooked it a perfect medium to my enjoyment. I preferred the cheese outside the patty. Next came Brian on the gas grill. As Brian unwrapped his patties, I was astounded at the size. Some pushed close to a full pound. 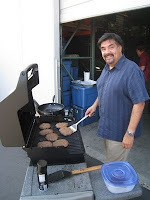 He cooked them up along with slices of thick bacon on the grill right beside them. 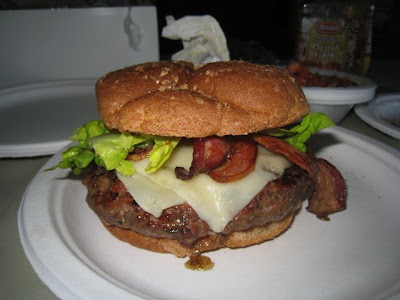 He finished grilling and had me grab a whole-wheat bun, laying the massive patty of Burger #3 on the bun and topping it off with the bacon. Left to choose from the many condiments Brian had provided, I picked them all, putting a little mayo, mustard and Brian’s special BBQ sauce on top. I also added some lettuce. The burger was very smoky and flavorful. Like nothing I have tasted before. I wished I had not put the BBQ sauce on. It masked the burger flavor a bit. I took some of the meat by itself and could not figure out what I tasted. Brian confided that he had purchased really low-fat ground beef and then added bacon fat to the mix to bring the fat up to 20 percent. The bacon was a little undercooked for my taste and that may be what pushed me to giving Andrew’s number two burger a slight edge in the contest. As the guys pounded down their burgers, a little secret came out. I had been played. 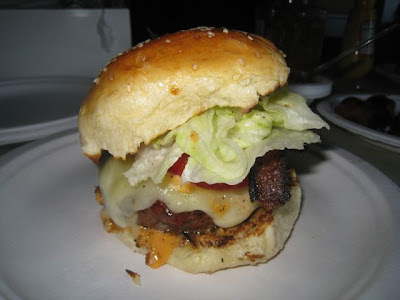 Andrew sandbagged me by reading my blog and cooking his burger to my taste. He purchased the déjà vu buns from the Palo Alto Creamery, my current favorite. The crisp bacon was cooked just like I describe in several of my blogs. He kept the meat seasoning to a minimum and relied on the meat to provide the flavor. The "Secret Sauce" was Thousand Island. Then again, after thinking it over, maybe I hadn’t been played. Maybe I had unwittingly schooled Andrew on how to cook a fine hamburger through the blog and my search to Master the Hamburger. I'm getting worried about you. do you ever eat vegetables?! but I hope you'll let us know when you post your Savannah piece, as I'd love to repost it, if you'll let us. Tell your mom, happy mother's day! Do Sweet Potato fries count as vegetables? How about lettuce and tomato. See my review today on B&D in Savannah. I had all three. So there.